2/28/19: Welcome, Virgina/North Carolina/New York! Competitive Mounted Orienteering (CMO) is one of the most challenging and exciting equestrian sports - for the competitive as well as family horse rider! CMO is like a mounted treasure hunt, which tests your horsemanship, your map reading ability, and your compass skills - all while having great fun with your horse! 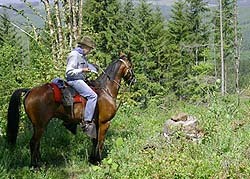 A CMO rider taking a compass bearing from a clue - A LARGE ROCK ON A STUMP. CMO stresses sound horsemanship, and we like to call it "The Thinking Horse Sport"! The long course can be anywhere from around 8 to as long as 25 miles. The terrain depends on the ride manager's choice of area - but CMO rides are held all over the country from the high forests of Washington State to the rolling hills of Indiana! The short course is much smaller, and is oriented towards families, riders wishing a less competitive event, training of new horses, and new riders looking to check out the CMO fun. Click here or here for a complete introduction. All riders are welcome. To check out a ride schedule in your area, follow this link. To join CMO, simply attend a ride in your area. The ride manager will help you with the application form, and your membership is valid starting right away! Click here for information on equine nutrition. Loss of open land has been identified as the greatest threat to the future of all equestrian sport, recreation, and industry. By educating horse people and encouraging partnerships with conservationists and other user groups at the local level, the Equestrian Land Conservation Resource is mobilizing thousands of equestrians to work for land access and protection in their communities. For more details, see ELCR's website, www.elcr.org. All equestrian groups have a stake in ensuring equal access to trails in all states and especially state and federal lands. This right is under assault by many groups, and it is up to horse enthusiasts all over the country to fight back. Information will be collected at the link above in an ongoing effort to preserve our traditional rights as horseback riders. If you ride a paint horse you may be eligible for points from the American Paint Horse Associaiton. The link above is to the Paint Alternative Competition Event Approval Application (whew!) which you can download and submit for consideration of NACMO events. Please consider making a donation to an organization that does good works related to horses. The link above will take you to a list of some of these worthy groups.